Known as the Xperia go in Europe, the US version of Sony’s smaller, but stylish, tough dustproof, water resistant smartphone is finally available, contract free for only $250.00. 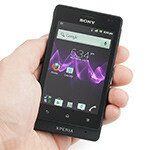 After being announced earlier this spring, and released in Europe months ago, Sony has ensured that this Android handset ships with reasonably current software (Android 4.0 ICS). The whole mission of this little handset is to put up with your daily abuse, whether you feed it to the dog or throw it into a bag of flour, the Xperia advance is your ticket. In our review of its European cousin, the Xperia go, we liked the compact form factor of it, but the build quality still felt a little cheap. The hardware could keep up, and it shoots good video, but the screen is mediocre. Call quality was adequate. Your mileage may vary of course, but at $250 off contract (prices may vary based on color), this dustproof and water resistant device makes a compelling case. It is available unlocked, but only supports the 850/1900/2100 frequency bands for HSPA data. this is one rugged bad a$$ phone!for $250. cool sony,. The mediocre resolution of this phone is like another nail in Sony's coffin.